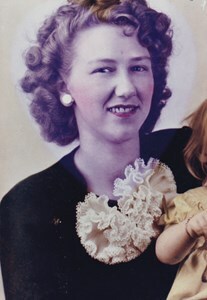 Florence M. Knighton, "Babe" , 95, passed away peacefully on Wednesday, April 10, 2019 at Our Lady of Mercy Life Center, with her loving family by her side. Florence was the daughter of the late Thomas and Florence (Steele) Espey. Florence was the devoted wife to the late John Knighton. She was predeceased by 6 siblings. Florence is survived by her children; Phyllis (the late Ken) Lubiniecki, Eileen (Tim) Burnham and Jimmy (Lisa) Knighton. She was the adored grandmother of Roger Groff, Kimberly Lubiniecki, Tim (Amanda) Burnham, Corey T. Burnham, John (Rachel) Knighton and Racquel (Connor) Knighton. She is also survived by her great granddaughter, Emma Grace Burnham; her brother, Don Espey, her sisters; Sara Tate and Helen Cornell and many nieces and nephews. A graveside service will be held Monday April 15, 2019 at 11:00 am at Memory Gardens, Colonie, New York. Memorial contributions may be made to the Mohawk Hudson Humane Society 3 Oakland Avenue Menands, NY 12204 in Florence's memory. Add your memories to the guest book of Florence Knighton.